Hartlepool United boss Craig Harrison. Craig Harrison hopes his FA Cup luck changes this afternoon. 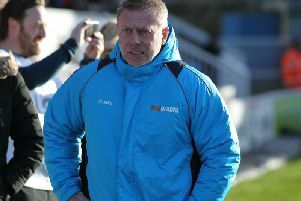 The Hartlepool United boss, who takes his team to South Shields in the fourth qualifying round, has unhappy memories of the world’s oldest club knock-out competition. “It’s a good game for the North-East, a really exciting one,” said the 39-year-old of the sold-out derby at Mariners Park (kick-off 3pm). “It’s my first involvement in the FA Cup as a manager. “My last involvement in the FA Cup was as a player, the game before I broke my leg and my playing career was ended. “It was at Newcastle with Crystal Palace. “That was my last involvement as a player in a competitive game of football. “So good memories? Not really! “But before that I was involved with Middlesbrough teams under Bryan Robson in the Juninho era and the like. “There probably couldn’t be a better draw for the region at this stage of the competition. “It’s good for North-East football. South Shields is a club Harrison knows relatively well and has an admiration for. Backed by the vision, and money, of chairman Geoff Thompson, the Mariners are the region’s team of the moment. Shields clinched a FA Vase-Northern League double last season and boast Julio Arca as their star name on the field. This season, they lead Evo Stik North by five points and have accounted for National League North clubs, Darlington and York, in the FA Cup. “I come from Gateshead and when I was living in Chester and spoke to my dad on the phone, the conversation was often about South Shields,” he said. “Who had signed for them, what they were doing. “It’s great for their club, it’s great that the chairman shows a bit of ambition. “People sometimes get criticised for showing ambition and spending money and wanting to go places and grow a club. “I think it’s great for the area, for another football club to grow. Fair play to the chairman. “He wants to get up the league pyramid as quickly as he can, which is great. Shields though will fancy their chances, no surprise given they have won 51 of their last 53 matches. Harrison added: “South Shields will have the confidence which comes from winning, but it works both ways. “When does winning become a complacency? “You would think though given they are facing a team from a few leagues above, there won’t be any complacency.